A few months ago, the greater Los Angeles area received a dubious honor — for the sixth consecutive year, the area was named home to the world’s worst traffic. Getting from point A to point B, in LA, as a general rule, requires sitting still, waiting for the car before you to move. Sure, maybe you know a shortcut, weaving through residential areas to avoid the backups on the freeways. But by and large, that’s limited to the driver’s knowledge of local roads. Or at least it was, until recently. Technology has changed the calculus, with Waze, combined with Uber and Lyft, leading the way. Uber and Lyft are, of course, “ride-sharing” companies — basically, app-based services which, at the tap of a few buttons, bring a car and driver to your location, who will transport you to wherever you wish to go (for a fee, of course). If you’re a driver for one of those services, you’re often in unfamiliar areas, and usually, that would put you at a disadvantage — you simply don’t know your way around. Apps like Waze can account for that, though. By simply driving around with the Waze open on your device, you share real-time information that translates into traffic conditions and road structure. When you use Waze, you can also actively report to the community on traffic, accidents, police traps, blocked roads, weather conditions and much more. Waze collects this information and immediately analyzes it in order to provide other Wazers with the most optimal route to their destination, 24 hours a day. The more people drive with Waze open, the better the navigation. As a result, sometimes, Waze-using Uber drivers find that well-kept secret shortcut. And other times, bad things happen. Take, for example, the Baxter Street, in the Los Angeles neighborhood of Echo Park, seen above. It doesn’t get a lot of vehicle traffic and for a very good reason — it’s narrow and extraordinarily steep. Here’s a video of a car going up, down, back up, and back down the hill, and it’s almost like a rollercoaster — a slow climb with almost no visibility as to what comes after the hill’s peak, and then a major drop on the way back down. And the second hill is worst than the first. (Click that link to see, but you may want to turn your sound off.) Can’t watch a video where you are? Here, from 2017, is a history of the street courtesy of LA Weekly. Either way, you’ll earn what residents of the area already know: Baxter Street is, simply put, best avoided. It’s difficult to drive on in the best conditions, and for the uninitiated, it can be downright treacherous. As a result, it doesn’t get a lot of car traffic. 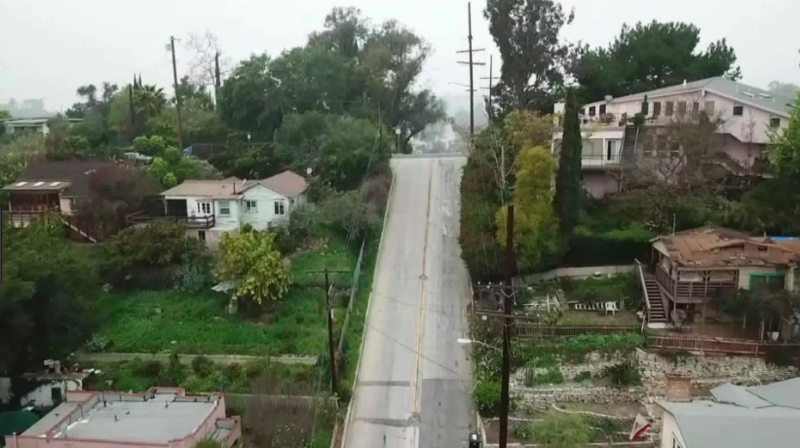 Residents wrote to Waze to complain but found no satisfaction; per NBC Los Angeles, Waze said it “could not remove Baxter Street from its system, nor add a warning message,” for reasons unspecified. Absent a change in the rules of the road, Waze was — they asserted — unable to do anything to solve the problem. So Los Angeles stepped in. In May, likely in response to the press around the issue, the city announced, among other changes, that various parts of Baxter Street are now one-way roads, at points in opposite directions. Waze, respecting these changes, no longer sends Ubers down that path — the road is no longer an effective way to avoid Los Angeles’ traffic jams. Bonus fact: Taking an Uber down (or up) Baxter may be bad, but it pales in comparison to the misadventures of a passenger-driver flip-flop from a 2016 Uber drive. That year, a 20-year-old named Juan R. Carlos hired driver Corey Robertson to bring him from Philadelphia to his college, 300 miles away in upstate New York. Along the way, Robertson grew tired and asked Carlos to hop into the driver’s seat and take over for a while. Carlos agreed and, when Robertson awoke, he noticed that Carlos was driving quite quickly. The reason why? He had blown past a speed trap and was now fleeing from the police. The trip ended poorly — Carlos, still driving, crashed into a guardrail. Both suffered minor injuries — and both were suspended from using Uber in the future. From the Archives: The Statue in Glasgow with a Traffic Cone on Its Head — Sometimes.